Is there a better alternative to One Small Feed? Is One Small Feed really the best app in Newsreaders category? Will One Small Feed work good on macOS 10.13.4? 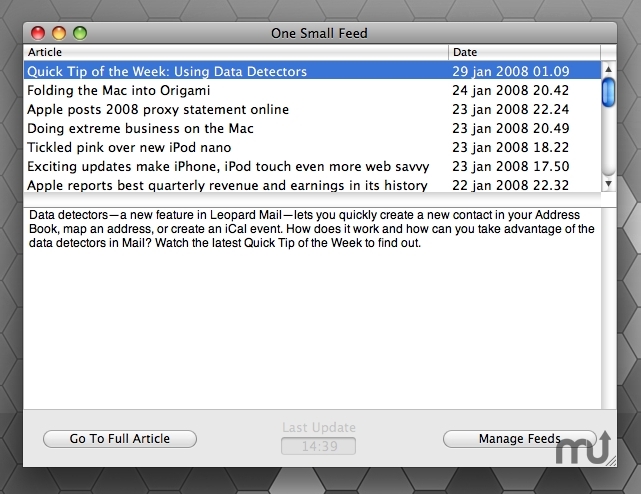 One Small Feed is a light-weight RSS reader programmed in RubyCocoa using the Ruby gem newcocoa. It strips all HTML from the RSS feed so it only shows you plain text, effectively removing all annoying advertisements some RSS providers put in their feeds. Just as my other software One Small Feed is geared to be easy to use, configure and manage your feeds. Requires MacOS X 10.5 Intel. One Small Feed needs a review. Be the first to review this app and get the discussion started! One Small Feed needs a rating. Be the first to rate this app and get the discussion started!